have your wedding on the 18th hole! • junior golf c amPs • revamPed rooms at the lodge SAN VICENTE INSIDER shoP in st yle! 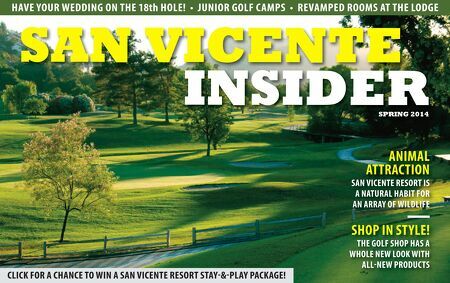 the golf shoP has a whole new look with all-new Products animal attraction san vicente resort is a natural habit for an array of wildlife SPRING 2014 click for a chance to win a san vicente resort stay-&-Play Package!